Rinse quinoa thoroughly; drain. Heat quinoa and broth to boiling in 2-quart saucepan; reduce heat. Cover and simmer 10 to 15 minutes or until all broth is absorbed. Stir in cream cheese and basil; cover and remove from heat. Melt butter in 10-inch nonstick skillet over medium-high heat. Cook garlic in butter about 30 seconds, stirring frequently, until golden. Stir in vegetables. Cook about 2 minutes, stirring frequently, until vegetables are crisp-tender. 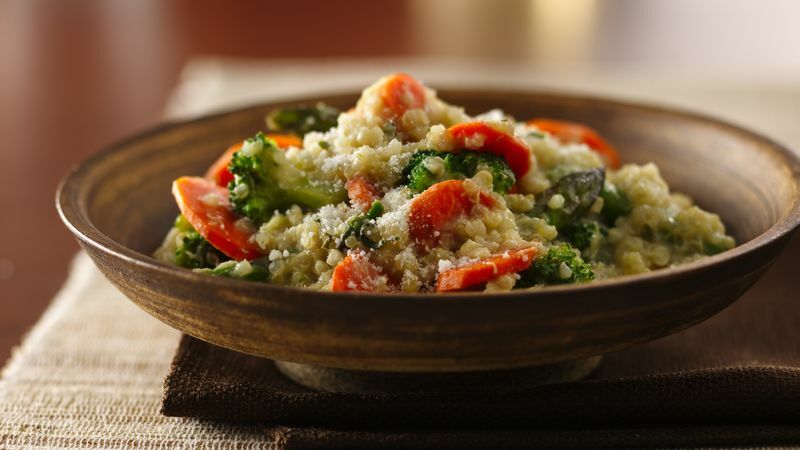 Toss vegetables and quinoa mixture. Sprinkle with Romano cheese. Quinoa is a tiny, pearl-shaped, ivory-colored grain that expands to four times its size when cooked. It's rich in nutrients, and unlike other grains, it's a complete protein. It's important to rinse quinoa really well before using it to remove a bitter-tasting and naturally occurring saponin (nature's insect repellent) that forms on the outside of the kernel.